Elon Musk’s Space X is applying for over 4.000 Internet Satellites. 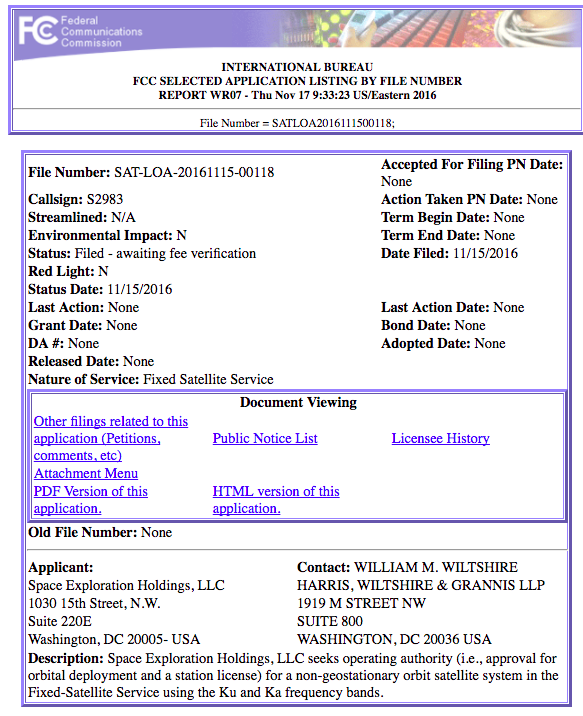 This is BIG News: Elon Musk’s Space X is applying for over 4.000 Internet Satellites. To be precise SpaceX wants to launch 4,425 satellites into low-Earth orbits, with altitudes ranging from 715 miles to 823 miles. Each satellite will provide aggregate downlink capacity of 17 to 23Gbps, the application said. “With deployment of the first 800 satellites, the system will be able to provide US and international broadband connectivity; when fully deployed, the system will add capacity and availability at the equator and poles for truly global coverage,” SpaceX said. Ok – But, what does this mean? 1. The Satellites are powered by the solar panels they makes. New additional profits and revenues for SolarCity / Tesla. 2. They are building a new worldwide wireless internet company, connecting the globe (competing with Facebook’s and Google’s approach to bring Internet to the rural areas as well). Most likely this could be also disrupting the Telco business, Sprint, T-Mobile, Verizon, Vodafone etc. 3. This will enable TESLA to provide ubiquitous connectivity for his autonomous car business.